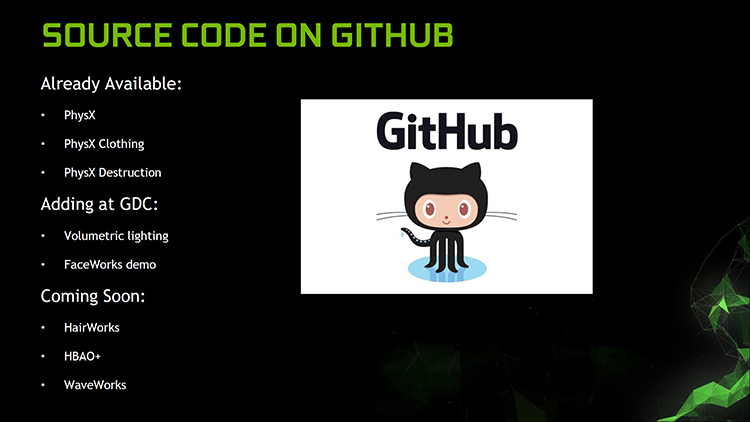 Just days ago Nvidia made the surprising announcement that it would be releasing parts of its GameWorks 3.1 SDK as open source code on GitHub and at the time a plethora of Physx technology had been uploaded. This move would allow developers to download the source code and tweak it, change it as they want and incorporate it into their title. Nvidia have made good on their promise they would release additional code to the public, and have just released FaceWorks, HairWorks and Volumetric Lighting too. Nvidia are promising their well received HBAO+ technology will also have its source code released to the world. This is fantastic news for both developers and gamers; GameWorks technology has been present in a lot of AAA titles – for example, Hair Works in Witcher, where it didn’t just render hair on characters, but also the fur of animals. Batman Arkham Knight also implemented a massive number of GameWorks features, and allowed for interactive smoke and fog, interactive rain and improved lighting. Unfortunately, the GameWorks implementation caused frame rate and performance issues in both titles, which were difficult for developers to fix. But now with open source technology, it will make things a lot simpler. Nvidia are promising we’ll see an additional GameWorks 3.1 update in June (along with HBAO+ being made open source, and GameWorks 3.2 will be available in September. News of Nvidia’s decision regarding GameWorks was surprising, they’d been asked to open up the technology for quite sometime; by AMD (their chief rival), game developers and gamer’s, as it would mean better adoption of the technology and developers able to better tweak the tech to suit their application or game. It’s worth noting that news of their decision came shortly after AMD’s own GPUOpen announcements which have been well received by game developers. Hopefully we’ll see the day where developers can pick and choose between the technology from either company as they want, or perhaps even delve in and splice in the best bits of code for their games. With any luck, we should also see games perform better across a wider range of hardware and with multi-vendor GPU setups being fully supported by DirectX 12 and Vulkan (Explicit Multi Adapter), this will be especially important in the future. From Nvidia’s point of view, it also makes some sense – it ensures PC gaming has further advantages over a console, which means more gamer’s are likely to look to PC gaming. Plus, it ensures the adoption of GameWorks, and will likely somewhat reduce the adoption of GPUOpen, which would certainly help their credability with both the developers and gaming public. After the negative PR of GameWorks lately, that’s only a good thing – right? If you want to get access to GameWorks libraries click here. Tagged with AMD, gameworks, hardware physx, PC, PC gaming, physx.